iCal Calendar for 2007 Board of Directors Election. Yes, long time since i write my last post on my blog, what could i say, is just that i’ve been very busy with my life, work and family, so when i was desiring to write a new post i didn’t find the energy and time to do it. It seems that i’m very good reading blogs and feeds, but very bad working with mine. After one year since we start with Traza there are some really nice news about it, first one is that i’ve been accepted as project leader at CORFO, so now we can apply to public funds from this government department. This instance is very important for us, cause we have been developing this software on our spare time, but now we are facing the chance to get some money, and new users and customers for the project, would be cool to get new developers too. Also to have CORFO behind you is a very good advantage when you talk about technology to managers or customers. So there’s a good chance to develop new applications based on GNOME for our small and medium companies in Chile. Today i found this message in my inbox: N810 maemo submission accepted, COOL, yes i know, i’ll have this wonderful gadget to play an so, but we want to use it to implement some features in our projects, for sample we need to develop some data functions in PDA or smartphone, but our software will be developed over maemo platform, since we use mainly python and pygtk to develop won’t be too hard to migrate them to maemo. At last i did some little hacks at GUADEC and they work very good. So it seems that good things are coming together, is a really good luck to have the chance to get a N810, since people from CORFO are asking for the mobile feature in Traza. This month is pretty busy, next week we’ll have a nice event at UA, GNOME Chile will be there :-), also my son Francisco and I will be on birthday this month. GNOME Day in Chile couldn’t be a success without your help, and obviuosly could be done without me!. Thanks to the board and foundation for the support, we get more than 200 people in the event. 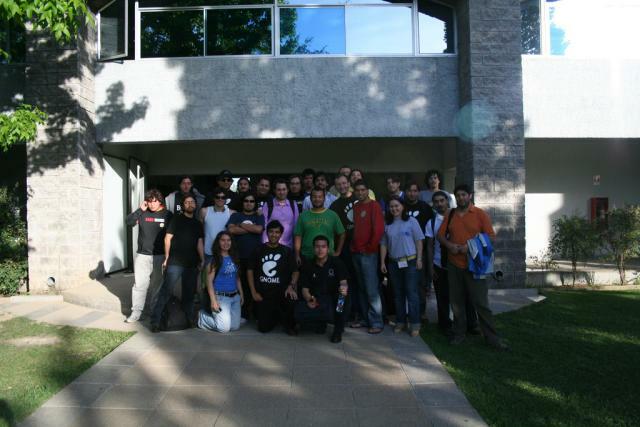 And we now that GNOME is People, in Chile we have a nice community, i’m happy to be here! See you in the next GNOME Day! Yay! we’re here, GNOME Chile is on the field, and we have our demo table ready to show our loved desktop to the public. 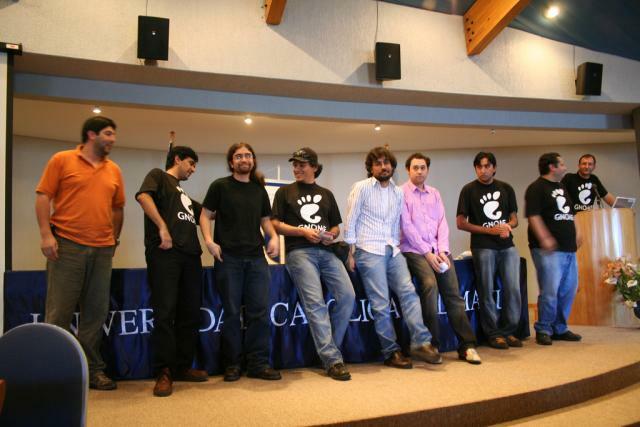 Lot of good energy here, i love this event, this is my 7th “Encuentro Nacional de Linux”. Fernando Herrera is here with us and he’ll talk about the GNOME project soon. Life goes on and there’s no spare time, last week I had many things to do and I could not put much effort in the GNOME day, however I hope get the final schedule done by tomorrow. Last Thursday we (Traza team) went to see match of Colo Colo at a restaurant, lamentably the chips that i eat there make me sick and I have been with stomach problems from that day, On Friday I had fever and spends all the weekend laid down, no hack. With all this forced “spare time”, I’ve installed Ubuntu edgy from the scratch, a very nice experience, it runs faster, there’s a lot of improves mainly by GNOME 2.16, but other stuff like OO.org or the boot speed are better, thanks guys you make me feel better. Lot of people are asking if they must pay to assist at GNOME Day, NO!, GNOME Day is open and free (as beer), you must add your name in the list and go there! Dave, we tried to speak with the people of Nokia Chile, only to ask for their help in the local diffusion for our event, thanks to the support of the GNOME Foundation and the friends at maemo.org and Nokia we are going to have Fernando Herrera in Chile. It is a great opportunity to make noise and to show GNOME in Chile. We called to Nokia asking them to help us with the press contacts. They are a great and big company and they have much more credibility and respect than our local team and me. We never requested money for our event, since we have the resources thanks to the Foundation and the work of the Chilean team. Lamentably the sensation that left me the conversation with Nokia in Chile, is that they don’t interest in anything that is not the mobiles phones, and this kind of events are not for them, so they are not aligned with the open source as in Europe. Fortunately we have a great team in Chile, we are working in the press release for the event and I am confident that we will be able to do it and attract the media to GNOME day. Thanks again for supporting the event, that compromises us to give the best. In Chile Nokia only sells mobile phones, so they are not interested in helping us to make publicity for the GNOME Day. Fortunately in Finland are people like Carlos who has the good will to allow that Fernando comes to share some days with us. After trying to get some help from Nokia in Chile to contact press and media i know that this effort will be done by us, alone. So that’s not a big problem, just i’ll add this task to our To Do list, i’m confident that we can prepare a good Press Release and bring some journalist to the conference. Let’s see what happens. We agree with the local team about the place for the GNOME Stand at the Hall and next to Aula Magna, the biggest room for the conference with 500 people capacity, so i hope to be placed in a good position to show GNOME to the public. The table in the picture is one of the tables that we’ll use for hacking, demos and the stand. The last facilities to check was one of labs in the Campus, there is one between those buildings with 50 desktops and local team at university will install ubuntu, so we’ll use it for our workshops. Next Thursday 22:300 PM (local time) we’ll have the next meeting at #gnome-chile in irc.gimp.org, so please attend!, we need to define what kind of installation need for this lab (libs, devel, etc. ), and of course check that other stuff is running smooth.